HomeNew CarsNews2017 Maruti Suzuki Dzire Old Vs New: What All Has Changed? Maruti Suzuki has unveiled its next-generation 2017 Dzire ahead of its official launch in India on May 16. The changes in the new model aren’t just cosmetic, they are skin deep. Almost every aspect of the old Swift Dzire has been worked upon giving a new identity and a fresh look to Maruti’s hot-selling car. Some quick facts about the Dzire - it’s for the first time that the sedan has been launched ahead of its hatchback sibling, the Swift (slated to launch later this year). From 2008 to 2017, the Maruti Suzuki has sold close to 17 lakh units of the compact sedan. The popular compact sedan accounts for 50 percent of the overall sedan sales in the country. Phew! The list doesn’t end here, the car has broken many records and created several milestones. 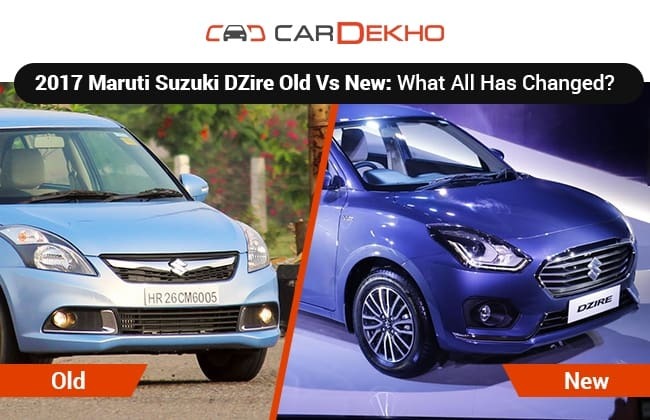 Let’s get back to our feast of the day - what has changed in the new Dzire. If we hide the ‘S’ badge of the Dzire it would be difficult for a newbie to guess that whether it’s the same Maruti Suzuki sedan. The front ditches the single thick chrome slat now and gets a broader chrome grille with horizontal slats. The bumper has been redesigned with new fog lamp housings. The big wraparound headlamp unit has been swapped for sober looking units with integrated LED daytime running lamps. It also gets an all-new auto LED projector headlamps. The dimensions too have received their set of modifications. The wheelbase is now longer by 20mm, which translates to more space inside the cabin. It’s 40mm wider and 40mm shorter than the existing Dzire. Surprisingly, the ground clearance has been reduced to 163mm – down by 7mm from the outgoing version. The new Dzire gets two-tone 15-inch multi-spoke alloy wheels which look better than the older car’s design. The rear profile has been redesigned too with LED guide lights in the redesigned tail lamps which don’t wraparound the sides like before. A thick chrome strip adorns the boot lid and the variant badging has now moved towards the lower end of the boot lid. The revamped rear bumper now features a set of reflectors. The high mount stop lamp is now flat and gets the LED treatment as well. It will come with six exterior colours options - Oxford Blue, Sherwood Brown, Gallant Red, Magma Gray, Silky Silver and Arctic White. As far as features were concerned, there was nothing much to complain about the outgoing Swift Dzire. Over time though, the competition in the compact sedan space has become fierce with the new Xcent and the Tigor making their way. With neck-and-neck competition, Maruti choose to fill up all the possible gaps with the new Dzire and it now comes with a touchscreen infotainment system that supports Apple CarPlay, Android Auto, MirrorLink and navigation. For added convenience, it gets rear AC vents, climate control and a reverse parking camera with sensors. There is even a charging socket and a phone holder next to the rear aircon vent. A new flat-bottomed steering with burl wood touch imbibes a feel of sportiness and luxury. However, the most important update for the new Dzire is the much more spacious boot space, it now stands at 376 litres – up by a good 60 litres. Moreover, ABS with EBD, airbags and ISOFIX have been kept standard across variants. The increased wheelbase and width has imparted more space inside the cabin. This has led to the rear shoulder room being increased by 30mm and by 20mm at the front. The knee room at the rear too is up by nearly 40mm. The rear cabin space of the Swift Dzire was something to complain about earlier, it’s good that Maruti Suzuki has addressed it this time around. The overall height of the car has been reduced this time around, and this has meant that the seat height too has dropped by 21mm. Sharing the same, lightweight platform of the Maruti Suzuki Baleno, the new Dzire is lighter by 85kg in petrol guise and by 105kg in the diesel variants. If it ain’t broke, why fix it. This seems to be the mantra that engineers have taken with the mechanicals of the new Dzire. It continues to get the same 1.2-litre 84.3PS petrol engine and a 1.3-litre 75PS diesel motor. Both engines are linked to a 5-speed manual transmission. Maruti has ditched the 4-speed AT gearbox from its petrol trims this time around. To replace the ageing gearbox, Maruti Suzuki has decided to equip both the petrol and the diesel version with the AGS (Auto Gear Shift) system. This automated manual transmission is available across all variants except for the base LXi and LDi. With the addition of a host of features, the all-new Dzire is likely to cost a premium over the outgoing compact sedan. Expect a price bump of Rs 30,000-40,000 over each variant of the current Dzire.